In an increasingly casual workplace, the basics of business etiquette can sometimes be lost. As millennials begin to become more prominent in the office, business etiquette can sometimes fall by the wayside in favor of catering to this energetic yet informal workforce. The problem is, there are still many situations in which business etiquette is a must. Presenting yourself in the proper way, whether it's for a big presentation or that first internship, remains as important as it's ever been, so here a few things to keep in mind. Follow your company's dress code. Follow it to the letter. Take note of what other people are wearing. Maybe business casual means something different at your new place of employment than it did at your old one. The worst thing you can be is under-dressed. Be well-groomed. This is not to say that you need to be clean-shaven or that you need to have your hair up in a bun every day, only that business etiquette states that you should appear as though you care enough about your job to look presentable during it. Proper etiquette is about more than just appearances - it's about professional behavior. Put your mind toward doing these four things every day and you'll be a better businessperson for it. It's about making a good impression every day. This starts with simply greeting your co-workers every morning. When a co-worker speaks to you, look them in the eye. Whether this person is working for you or with you or is your boss, they deserve your attention. Show appreciation. Again, whether you're showing appreciation to someone who is doing work for you or someone for whom you're working, it is paramount to working effectively with others. Not only is it beneficial for people to know you appreciate their work, but it's important to remind yourself that your own work is beneficial to more people than just yourself. Give credit where credit's due. We've all been there. We've all experienced the boss who takes credit for your successes and blames you for your (or their) failures. Don't be that person. You're part of a team. A team succeeds and fails together. Take credit for what you did, sure, but do so with humility. Today's office has so many methods of communication that it becomes very easy to say nothing at all. 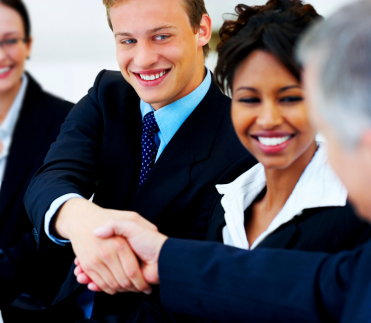 Follow these tips to correspond effectively while following proper business etiquette. Emails are a great way to communicate in the office, but they're also incredibly dangerous. Sarcasm often does not register over the computer, so something you say as a joke can come back to bite you. Follow proper email etiquette by keeping your emails clear and concise and you're less likely to cause confusion. Big Brother is watching. As you write your emails or send those instant messages, keep in mind that everything you write can be seen and is likely being monitored. Does this mean you can't make lunch plans? No. But if you begin wondering if that joke you're about to type crosses over the line, slowly back away from the computer and get a cup of coffee. It's not worth the risk. In many ways, business etiquette means different things to different people, but keep these basic tips in mind and adapt to your workplace's interpretation and you will never allow poor etiquette to impact your performance. Everything You Need to Know about Proper Business Etiquette - InLoox • Copyright 1999-2019 © InLoox, Inc. All rights reserved.